With the recent release of their debut EP, In Limbo, Naz & Ella are a duo writing about more than just love and heartbreak. While they are not opposed to writing the odd love song, it is current political and social issues that have captured the attention of this indie-folk duo, inspiring their debut EP. Aptly named, In Limbo focuses on the state of uncertainty that personal and social issues, or even political events can induce. 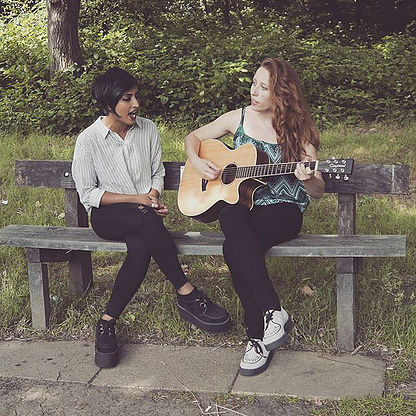 With songs about Brexit (In Limbo) and the freedom to love (Love Is Love) featured on their EP, Naz & Ella voice their thoughts on topics frequently neglected in music. Naz & Ella are influenced by duos such as First Aid Kit and The Pierces. Listeners have compared their stripped back sound, comprising vocals and guitar with the occasional percussion, to The Staves and a female Simon & Garfunkel. The indie-folk duo combine intricate fingerstyle guitar with ethereal harmonies which have been described as “formidable and defiant” by Fresh On The Net. Naz’s soulful voice and Ella’s delicate harmonies seamlessly complement one another when their voices join, lifting their honest lyrics into new planes. They received overwhelming airplay of their debut single Love Is Love. Within weeks of its release Love Is Love was featured on several BBC Introducing radio shows including Tom Robinson’s 6 Music BBC Introducing Mixtape and BBC Introducing London. Selected as ‘Track Of The Week’ on BBC Introducing Beds, Herts, and Bucks, their debut single was played across the station during that week and they were invited to play live on Saturday Breakfast with Justin Dealey. At current, Naz and Ella are booking gigs for the summer of 2017.